Just a few weeks ago, we announced the sector data for 2018 in the Biocat Report (highlighted this month in the journal Scrip) and now 2019 has kicked off with bang in the BioRegion of Catalonia. Like every month, here’s a three-minute summary of the most important headlines from Catalan companies and research organizations. Let’s start off with the institutional news, which promises to give the ecosystem a good push. The Government of Catalonia has passed the National Pact for the Knowledge Society, which strives to pool the efforts of universities, research centers, technology parks, employers’ associations and trade unions to boost innovation in the Catalan economy and facilitate the transfer of knowledge from centers to companies. 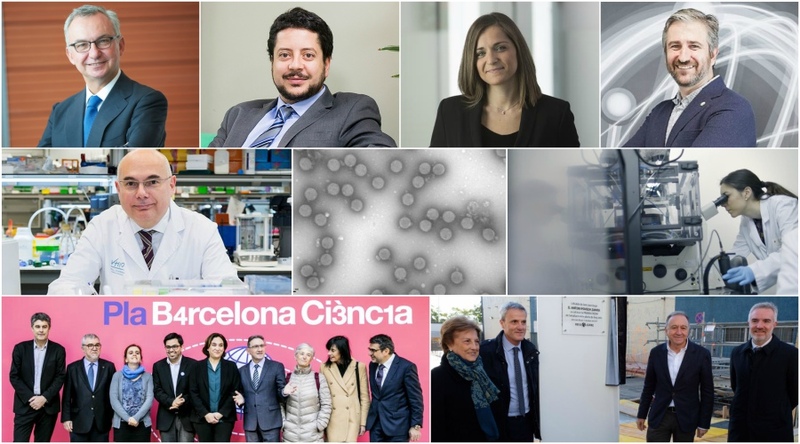 The Barcelona City Council has announced its Barcelona Science Plan to promote citizen participation and research in order to become the European capital of science and innovation. The “la Caixa” Foundation will donate €1 million. Also in the Catalan capital, Barcelona Activa has set up an innovation laboratory for start-ups: the User Experience Laboratory (UXLab). The lab specializes in designing projects based on the users’ experience. A bit further away, in California, ACCIÓ has launched an initiative called ‘Catalonia Exponential’ to apply innovation from Silicon Valley to promote the transformation of start-ups, SMEs and large companies. The section on names in the news is full of movement this January. Josep Baselga has joined the pharmaceutical corporation AstraZeneca as head of Cancer Research and Development. Additionally, the Diplolicy consulting firm has brought on Ignasi Belda, former director of the Barcelona Science Park, to handle issues associated with the healthcare sector and biomedical companies. Asabys Partners has also bolstered its team with the addition of Nuria Aloy Sala as finance director. Almirall has announced the appointment of Francesca Domenech as its new chief digital officer and member of the management board. The Catalan pharmaceutical company expects to post growth of 45% and EBITDA of €205 million for 2018. The general manager of Hospital HM Delfos in Barcelona, Juan José Pérez Villar, has retired and Josep Maria Payà, head physician at Delfos, has taken over his position. HM Hospitales will invest more than €11 million to renovate this center. In the digital health arena, Frederic Llordachs, co-founder of Doctoralia, has launched a new consultancy project for digital health start-ups: Braincats Consulting, at the Barcelona Health Hub. Additionally, Peter Edman, former AstraZeneca executive, has left the board at Mind the Byte. Speaking of Doctoralia, the company is continuing its expansion in Latin America, with offices open in Chile and nearly ready in Argentina. Palex Medical has closed a deal with Japanese multinational corporation Otsuka to distribute a medical device to treat inflammatory intestinal diseases in several countries in Europe. Also looking to Europe, Minoryx Therapeutics has opened a new subsidiary in the Brussels South Biopark, in Belgium, to work on new R&D projects. Medcomtech has formalized a capital increase of nearly €1 million to refinance the company’s debt. MJN Neuroserveis has received an EU grant for €1.8 million, which will allow them to conduct clinical studies on their device for epileptic seizures in Madrid and Germany, and Glycardial Diagnostics has received €1.9 million to continue development of their test to detect strokes early. MOWOOT, created out of the d·HEALTH Barcelona program, has launched a crowdfunding campaign on Capital Cell to raise €400,000. A similar figure, specifically €325,000, is what GENESIS Ventures has invested in five start-ups, spin-offs and projects in the biomedical arena in 2018. Top Doctors is negotiating an alliance with insurance broker iSalud to offer joint services. Institut Marquès and Mútua Terrassa have also joined forces to offer reproductive medicine services at Àptima Centre Clínic. Grifols has sold the plasma donation centers previously owned by Biotest US Corporation and German company Haema to Scranton Enterprises, a Dutch holding company controlled by the Grifols family, for €469 million. Part of these funds have already been earmarked, because Grifols has signed a €290-million licensing deal with Riger Pharmaceuticals for European distribution rights to the drug Fostamatinib for chronic immune thrombocytopenic purpura. Ferrer has closed the sale of Tarbis Farma, its generic drugs unit, to Hetero, one of the main pharmaceutical companies in India, through its subsidiary Amarox Limited. Rovi has acquired the drug Falithrom, used to prevent and treat thrombosis and brain hemorrhages, to market in Germany. Another pharma company, Reig Jofre, has laid the cornerstone on its new injectable medicines plant in Sant Joan Despí. The new building, with 2,500 square meters of space, is expected to be operational in 2021, allowing the company to hire 100 new employees. Institut Guttmann is also inaugurating facilities, with a new complex in Barcelona’s Sagrera district. The institute has invested €17 million in this facility that includes 40 adapted apartments and a neuro-rehabilitation clinic. In oncology, Josep Tabernero, researcher at the Vall d’Hebron Institute of Oncology (VHIO) and head of the Medical Oncology Unit at Vall d’Hebron Hospital, will be participating in a project recognized by Cancer Research UK. It will have €22.5 million to delve deeper into the relationship between the microbiome and colorectal cancer. A study conducted by the IOB - Barcelona Institute of Oncology has shown that ribulin is effective in patients with invasive ductal carcinomas, the most common type of breast tumor. Their results have been published in Oncologist. Additionally, the Pediatric Oncology Unit at Hospital Parc Taulí in Sabadell is closing its doors and its patients will be referred to Vall d’Hebron Hospital. Other experts in pediatric oncology, those at Institut de Recerca Sant Joan de Déu and Hospital Sant Joan de Déu, have proven the efficacy of a virus-based therapy to treat retinoblastoma, the most frequent eye tumor in children. The study was published in Science Translational Medicine. False positives on mammograms indicate a predisposition to tumors: this is the conclusion of a study published by Hospital del Mar and Institut d’Investigació IMIM in the British Journal of Cancer. Two new developments in cardiology. First, Vall d’Hebron has successfully conducted the first hybrid surgery on an adult with a congenital heart condition in Catalonia, carrying out two interventions in the same operation room. And, second, the Hospital Germans Trias Heart Institute has tested for the first time in Europe a cardiac device designed in Israel and is participating in a global clinical trial of this implant that is inserted between the two atria of the heart to lower pressure in serious cases of heart failure. In neurology, the epilepsy units at Hospital del Mar, Hospital Clinic-Sant Joan de Déu in Barcelona and Hospital Universitari i Politècnic La Fe in València, have joined the Clinical Patient Management System (CPMS) telemedicine project promoted by the European Commission. This initiative allows medical professionals to consult with a panel of experts from the European Union to diagnose and treat complex cases of the disease. For their part, the Barcelona Microelectronics Institute (IMB-CNM, CSIC), Catalan Institute of Nanoscience and Nanotechnology (ICN2), CIBER Bioengineering, Biomaterials and Nanomedicine (CIBER-BBN) and the August Pi i Sunyer Biomedical Research Institute (IDIBAPS) have developed a graphene graft that can detect low-frequency electric activity over large surfaces in the brain. The study was published in Nature Materials. A team at IDIBELL and the Center of Regenerative Medicine in Barcelona have discovered that defective astrocytes, a type of glial cells in the brain, are associated with a buildup of a toxic protein that is characteristic of Parkinson disease. The paper was published in Stem Cell Reports. People with Attention Deficit Hyperactive Disorder (ADHD) are more likely to use cannabis over the course of their lives, according to a study by the Vall d’Hebron Research Institute (VHIR) published in Molecular Psychiatry. An international study published in Nature Genetics with collaboration from the Institute of Evolutionary Biology (IBE), Barcelona Institute for Global Health (ISGlobal) and Pere Virgili Institute (IISPV) has identified 124 genes associated with risky behavior. Positive behavior, however, includes listening to music we like: in this regard, a study conducted by the University of Barcelona, IDIBELL, Biomedical Research Institute Sant Pau and the Autonomous University of Barcelona has revealed a causal relationship between the dopamine neurotransmitter and the pleasure people experience when listening to some music. Another study by IDIBAPS and the CIBER in Diabetes and Metabolic Disorders (CIBERDEM) that has been published in PNAS discovered a mechanism through which obesity causes insulin resistance, which can lead to type-2 diabetes. IDIBAPS is also participating, with UPC, in the EURO SHOCK project: the first large-scale clinical trial researching implementation of a new treatment to reduce the mortality rate of cardiogenic shock. A VHIR study, published in Allergy, has determined that the average survival time for patients with chronic hypersensitivity pneumonitis is 7 years and at the end of 5 years from diagnosis the survival rate is 68.5%. Researchers at the Autonomous University of Barcelona have shown that chromosomes are packed in stacked layers of chromatin. This structure, which was first proposed in 2005 by the same scientists, is highly compact and could preserve the integrity of the DNA during cell division. The study was published in EMBO Journal. IRB Barcelona has discovered a new mechanism that allows eukaryotes to synthesize proteins that bacteria can’t generate. The study was published in Molecular Biology and Evolution. Furthermore, their colleagues at IRBLleida took part in a study that associated obesity with poor kidney function and increased risk of death. The results have been published in The British Medical Journal. Researchers at the UAB and the University of Maryland Baltimore County (UMBC) have published a new process capable of generating resistance to synthetic antibacterial drugs in Frontiers in Microbiology. The Institute for Bioengineering of Catalonia (IBEC) has created hybrid robots with both synthetic material and living muscle tissue, using 3D bioprinting. And another report that brings science fiction into reality: Embryotools has achieved the first pregnancy in the world using nuclear transfer to treat infertility.